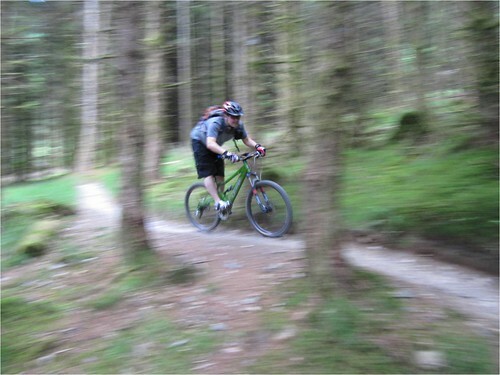 Coed y Brenin is one of the original Trail Centres, and make no mistake, it’s still one of the best! We chose Dragons back as past experience has told use that its one of the best. Expect the vast majority of the climbing to happen in the first half of the ride leaving the second half a singletrack delight! The trail starts with a crazy paving of large rocks and boulders that take you from under the comedy large set of suspension forks right into the woodland. I can’t say it’s my favourite section as it is difficult to get a rhythm and settle into a flow but it does serve the purpose of getting you warmed up and ready for the next sections. The trail then turns into some fantastic flowing single track that traverses through the forest without gaining nor losing much elevation. These sections give you a taste of how stunning this forest is with plenty of waterfalls and rock features that really make this place stand out as an area of natural beauty. As you approach the final sections before the first monster climb you hit some linked up berms that project you out of the singletrack, a last smile before the climb that lies ahead. The climb starts off on a tarmac forest road which just keeps going. Just as you think you must be at the top it turns a corner and goes up some more. Steep in sections, it’s not technical just a slog. About half way up there’s a nice piece of singletrack in place just to remind you what all the climbing is there for, but all too soon you are back on your way up. 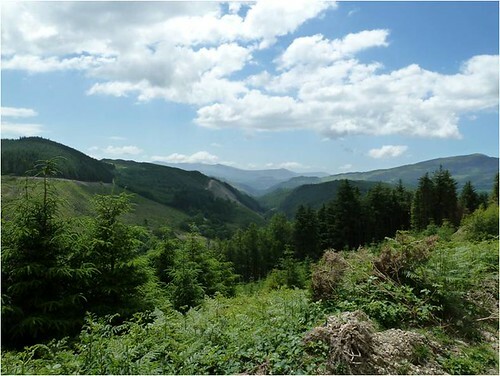 This is the only trail I know of that has two refreshment stops on its way around, so don’t forget to take some lose change and claim you ice cream in the latter stages of the climb! Once at the top you are greeted with some stunning scenic views over the valley as you start the first descent. This descent is on a forest road, I know what you are thinking, a forest road descent after all that climbing, but this bit of forest road is different! You can get some eye watering speed on it and it is an absolute hoot, and worry not, there is plenty of singletrack to come! As soon as the forest road blast is out of the way you hit the singletrack and the sheer variety on offer in the sections is awesome, from fast flowing to technical and rocky, each of the Munster/Adams Family named sections are just perfect! My personal favourite is Uncle Fester, pedally at first it then breaks into a perfect flow. It makes all the climbing at the beginning worthwhile. The sections just keep coming right up until the point when you re-join the MBR trail for the final few sections of the trail. This feels like a come down from the proceeding sections, plenty of forest road links where you can discuss the sections you’ve just nailed and a few climbs to remind you that this trail is still going to push you hard. 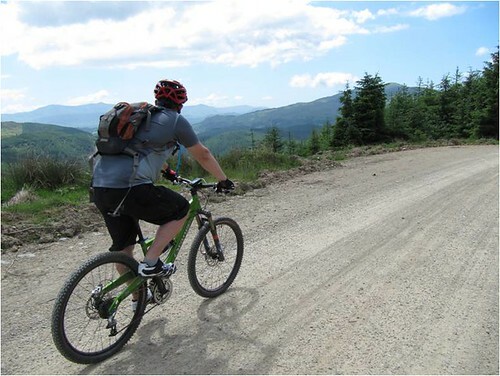 You finish the trail on a few more singletrack sections, a mixture of fast flowing and rocky technical trail before rolling back to the visitor centre for a jacket spud in the cafe! All in all, this is one of my favourite trails. You have to make an effort but the rewards are plentiful! If you feel like 31km isn’t enough for you and you are a glutton for punishment, you can opt to do the Beast of Brenin which knits together Dragons Back and the entire MBR trail. I might just opt for that one next time. Writing that just made me want to go back.. brilliant trail! Heh, just taking your journalistic advice! Looks great from the write up. I going to get my act together and have a trip up there!